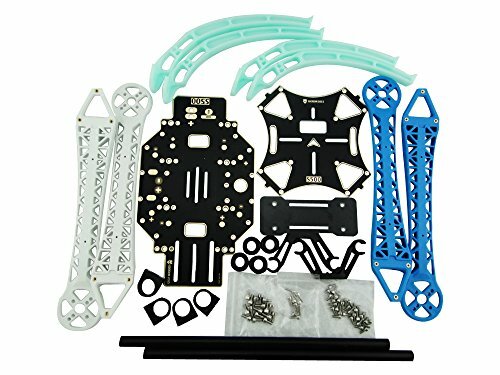 The S500 is a entry-level and practical multi-rotor air frame kit for F450 upgrade quadcopter, which are mainly made of durable PCB board and hard plastic materials, and can work well with Gopro Hero 3 2 Axis brushless gimbal or 808 gimbal for FPV (the total weight of gimbal and camera should be less than 400g for best performance). It comes with a large mounting board at the front and rear for mounting cameras or other accessories. No extra mounting brackets are needed. Colored arms for orientation to keep you flying in the right direction. With gimbal or FPV equipments: 2218 3506 3508 motors, 20A ESC, 11-12 inch propellers, 3s/4s battery, more than 4000mah.